Fences, by design, aren't the most socially friendly constructions, in that they're usually meant to keep people and things apart. But this creative pet owner found a way around that, all for the sake of his dogs and their friend next door. He built them a fence window. Reddit user ryanispiper told The Dodo that he got the idea after watching his three dogs constantly peering through the slats in his fence to catch a glimpse of his neighbor's dog, whom they'd often engage in a friendly game of chase along the boundary. He thought it would be nice if they could actually interact face to face - and sure enough, it has been. "The dogs really do enjoy it," he said. "They go out each morning and visit with each other if they are all out together. They still chase each other along the fence line, but I think they are happier actually seeing who they are chasing. They give each other some puppy love and sometimes just stare or bark at each other a bit." Sweet as it is, this isn't the first time a pet owner has been kind enough to indulge their dog's curiosity about the world beyond. Here are more examples of people who build fence windows for their pups. "My dog looking through a hole I cut in our fence that my neighbors son drew on"
"We had to cut a hole in our fence so our dog could see out." "I got to meet the neighbor dogs on my afternoon walk." "My dog waiting for her friends thanks to her custom fence"
"Neighbour put doggy hole in fence so she can come say hi!" Love this idea? 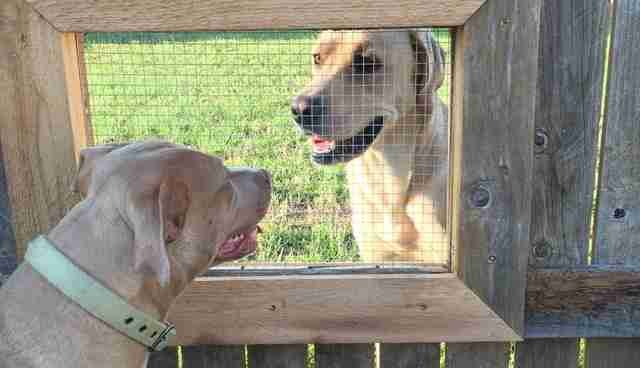 Click her for tips on building your very own doggy fence window.